A long time ago on a Boston visit for March Madness, I visited a book store (Borders, RIP) and bought Pride and Prejudice and Zombies. And as sometimes happens, it sat on my shelf for nearly seven years. I decided with a movie coming out it was time to finally read it. Unfortunately, I wasn’t entirely thrilled with it. (Which pained me a little since Quirk is a Philadelphian publisher.) It didn’t differ enough from the original to be something new and interesting to me. I also wasn’t happy with the dash of Orientalism. However, I am the rare sort of bookworm who sometimes feels the movie is better than book. So I had home for the film adaptation. When it comes to books I’ve loved, I approach film and television adaptations with caution, but mostly with intrigue. A bad adaptation doesn’t ruin the original for me and I can brush it off. Sometimes I can even enjoy bad adaptations a little bit. Then there are books I’m not really feeling, but in my head I see it as a story better suited for the screen. I have to admit, reading the first Hunger Games book I felt that way. Books and movies are different art forms suited for different types of stories and I am able to accept that. I simply love seeing how art transforms in other mediums so I don’t have that dread of how a book will play out on screen. If it fails, it fails. So then there is a book like Pride and Prejudice and Zombies that bored me a little in book form, but was completely entertaining in movie form. It was the silly and gruesome story I had hoped the book would be. They took a lot of liberty with Austen’s original story which I feel worked out better in the end. The little tweaks made in the book meant characters and events were altered in a way that didn’t make complete sense in the end. The movie writers made more appropriate changes to make a zombie war work. There were unexpected plot changes which made it more engaging. I laughed more than when reading the book. It also provided an extra-broody Darcy. This is one of those instances I’m going to tell you to skip the book and just see the film. I know, I know. Blasphemy. But the idea to take the original text of a beloved Austen novel and alter sentences didn’t pan out quite as well as I hoped. The movie added more battles and new storylines that made everything a lot more fun. I think Jane Austen herself would have been entertained. I am sure there are more book lovers out there who have been more pleased with film adaptations than the novels. Come out of hiding! “The book is always better” is untrue. Does the book often offer more background information and depth of character and nuance in the plot? Yes, of course. There are many beloved books that didn’t impress me so much acted out. And then there are some ideas that were better suited for the screen. Or one form isn’t necessarily better than the other, just different. When it comes to Pride and Prejudice, I adore the 2005 adaptation people scoff at. I feel like it captures the essence of the original story, but is something else on its own. Basically, books v. movies/tv doesn’t have to be so much of a competition. The book isn’t always better than the movie or vice versa. Which is better depends on who you ask. 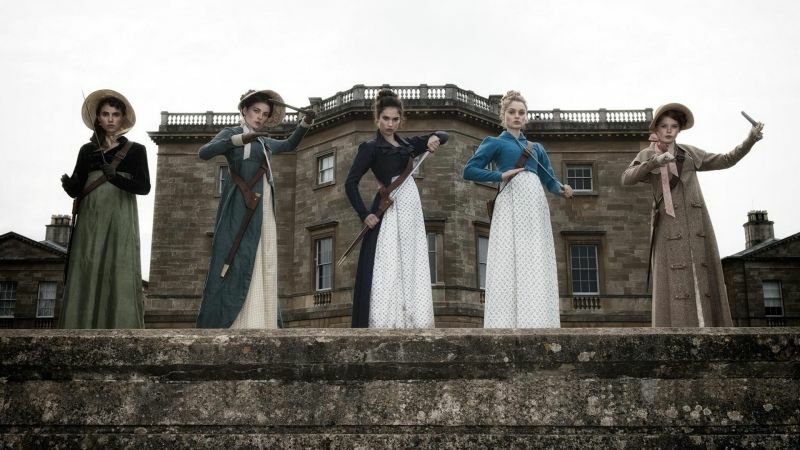 And if you’re asking me about Pride and Prejudice and Zombies, the film definitely wins.